Transfers are only included in the rate where stated in the room rescription. Family rooms available for up to 6 persons (4 children sharing with 2 adults). Children sharing a room with adults must be 12 years or under. Breakfast is only included in the rate where stated in the room rescription. 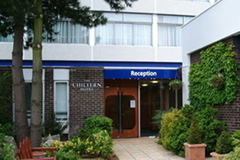 This friendly hotel is situated in Luton close to the M1. The hotel has recently undergone a refurbishment program including all public areas. All rooms have en-suite bathroom, tea and coffee tray, Satellite TV, Iron and ironing board, Modem/data port connection, trouser press and hair dryer. Clients cars are kept on site at hotel. The car park has CCTV and security lighting and is regularly patrolled. TAXI TRANSFERS RUN 24 HOURS INCLUSIVE IN THE RATE AND MUST BE BOOKED WHEN CHECKING IN TO THE HOTEL. Free of charge. Please note: LUTON AIRPORT AUTHORITIES are now charging £1 PER CAR to go into the airport drop off zone - this means you will have a cost of £1 to be dropped off by the terminal. 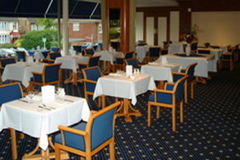 There is a main restaurant and the lounge bar which serves light meals. A room service menu is also available 24 hours. children sharing a room with adults must be 12yrs or under. 8 smoking rooms are available on request. Well above average hotel, good selection of breakfast items. Rooms good and quiet. Staff courteous and helpful. Good Taxi provider for airport, reliable and efficient. 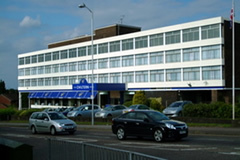 A typical 3 *** hotel in the suburbs of Luton with secure car parking, clean bedroom and use of bar & resturant . The offer I used included a nights accommodation up to 15 days parking and taxi transfers to and from the airport an excellent offer not to be missed if you have an early flight and don't want the anxiety of leaving hours before your flight to travel to the airport then this is an excellent alternative . We found the beds a little uncomfortable but otherwise it was acceptable. The food, dinner, was good and the leaving the car in the car park at the rear worked out very well. Our major grouse was on our return there was a mix up with the taxi service. The taxi firm were surly and would not accept that there was a taxi booked even thought i had a card from the Chiltern with all the details on. The operative would not give his name so I had no point of reference when I rang the hotel. The hotel sorted it all out and a taxi from the firm with whom they had booked turned up a little later. Not what you need after you had to get up at four o'clock in the morning. 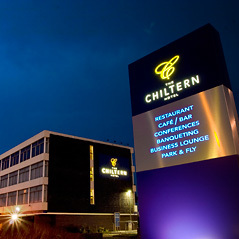 The Chiltern Hotel was OK. Average bar, reasonable Restaurant. Satisfactory rooms but walls were thin (corridor noise). Corridors needed painting. Skirting boards were scuffed. Booked morning alarm call didn't happen!! Duty receptionist said it wasn't logged. Very unprofessional. Morning taxi was 5 minutes late. Return taxi from airport was great. Received text message advising of car registration number and type of car to look for. We found the hotel very good,Easy parking with good taxi service to and from the airport. (all included in the price. )Very nice room,nice comerfortable bar and resturant.No complaints at all.Will definately go there again when flying from Luton. The hotel itself was fine we slept well. Having said that, the parking facilities for a two week stay is not what we expected ! It is a unsecured "pub carpark ' that is on a main road which didn't fill us with any confidence . We were expecting the car to be moved to a secure site , this was not the case . The booking process with FHR was simple and easy. The hotel however was dirty, falling to bits and we didn't even get the room we had booked. Use FHR but don't use the Chiltern! Great service from hotel staff and taxi. The hotel could do with a makeover but was adequate and we had a lovely meal in he restaurant despite the low temperature which the hotel did their best to rectify!! The taxi driver from airport to hotel was lovely, however the one from hotel to airport was late and not very helpful!! Absolutely fine clean & easy parking although we had to pay an extra Â£3.50 for the taxi as Luton have imposed drop off charges for taxis at the airport. Clean and all facilities in room and hotel were good and met our needs. Reception booking in and airport transfer very good and will book again. We parked for 4 days before staying at the Chiltern Hotel on our return. When we arrived and left the car the receptionist was very helpful, she arranged the taxi to the airport (included in the hotel/parking rate) which arrived within 10 minutes. Journey to the airport was 10 - 15 mins but we were dropped just outside departures. We were given a telephone number and booking reference for the taxi when we returned. On leaving the arrivals lounge I rang the taxi company, the driver was waiting for us when we got to the pick up point (A text message with the details was received prior to this). The hotel room was fairly small but very clean. The bar was ok as was the food. The only thing for me was on the night of our stay it was the 2 or 3 course Carvery special, not really my thing as I'm not keen on roast dinners but there was nothing wrong with the food. Very good location to the motorway. Would have no hesitation using this hotel again. 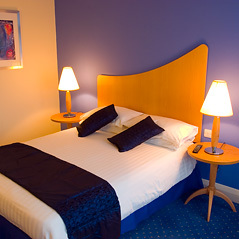 Good value package for overnight stay before flight and parking for the week, only Â£95. This included taxi's to and from the airport, provided by the hotel, which take about 10/15 mins. Hotel is ok, clean and tidy, comfortable bed, staff helpful. Luton however is a dump! Used the hotel stay overnight before flight and 7 days parking. Still good value and I like the new standard of decoration and fittings in public rooms and bedrooms. Taxi service to and from airport by Circle Taxis good as ever. Only problem was the limited food service and choice on the Saturday evening I stayed over. This was a very comfortable hotel. Our room was spotless and we were able to have a good meal We did not have breakfast as we had to leave before 5 am. The parking was very good. The hotel has a worn, tired appearance. The shower head in our bathroom was badly in need of descaling. 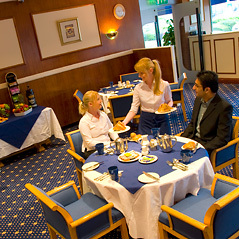 However, it was only for one night, the staff were helpful, and the restaurant was very reasonable and decent quality. I'd use it again. FROM THE M1 MOTORWAY. Leave the M1 at junction 11, following the A505 towards Luton for approximately one mile. At the traffic lights (by Vauxhall Dealers)you will see the hotel on the left in front of you. Turn left here and turn right into the hotel entrance. Please note: LUTON AIRPORT AUTHORITIES are now charging £1 PER CAR to go into the airport drop off zone - this means you will have a cost of £1 to be dropped off by the terminal and £1 to be picked up outside the terminal.